Map Description Well, an older version accidentally got stuck in the Community Bonus Pack. This is a new version, complete with bug fixes and some minor changes, mainly for the MSU contest. Lightning could be better, but it`s ok. Set WorldDetail at least to High to see some decos. I can frag with green eggs and spam! Brought to us by the same mapper who made the Nali City featured map: DM-Tree of Ages. 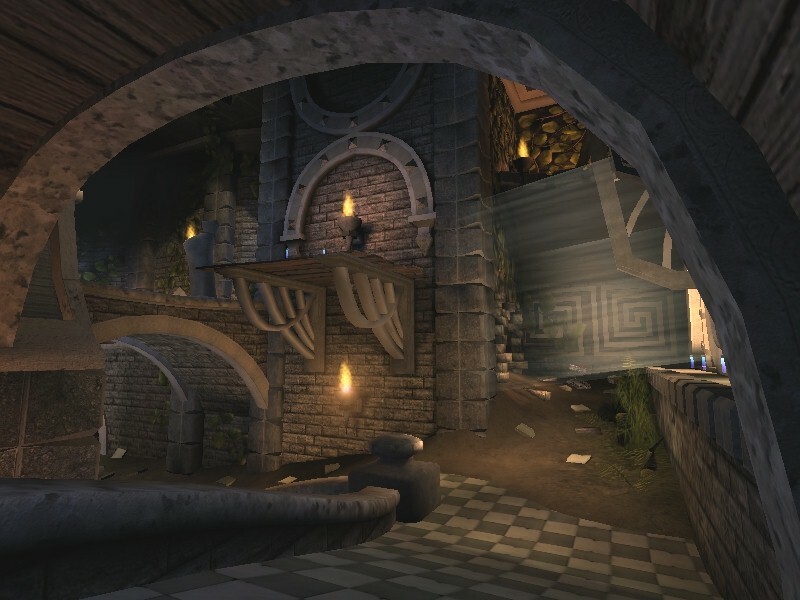 VorLon ups his stakes with custom textures, cube maps, projectors and a load of new meshes in his new map DM-Arkanos. The custom music file ONP-Intruder.ogg is by Toxeen, other credits are given in the readme. I have also played the CBP version, most of my comments remain the same for the Final version. Because of its simple layout, some people have used this map for 1 on 1 action, afterall the rcommended player load is 2. Let me tell you, with 15 Player Starts this map really is better at the 3 to 5 range. There is room for more, but pick ups become scarce. One thing that is truely unique is the maps theme. If Dr Suess played UT2003, he'd be fragging here. What gives this map its special look is the abundant custom meshes, 59 in all. Very little BSP is visible through the map. What is there, creates strong contrasting shadows. 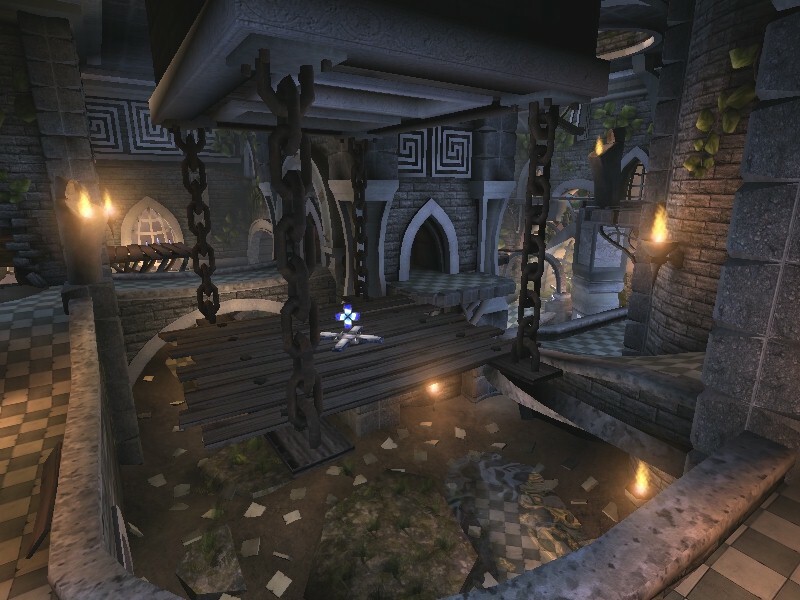 The BSP, when looked at alone, reveals the map is comprised of one large room with a central structure, a lift shaft, and two smaller cubbies connecting some ramps. Sounds pretty basic, but then add all the mesh work and the detail level becomes increasingly complex. Plus terrain and a fluid surface to top off an already full tank, this map virtually spills over with eye-candy. The only thing saving this organized mess is a liberal dose of anti-portals. Even so, the number of mesh triangle rivals the larger maps in this pack. Each mesh is fairly optimized for poly count, however, there's just really a lot of them. It is a testiment to the game engine and new tech that this map plays at all. Given these facts, it is no wonder that the recommended player count is a low 2. More players incure a number of frame crunchers: projectiles, dynamic lighting from weapon fire, player shadows, all of which easily drags the FPS into the teens for an average rig of 1.2 GHz. One thing that comes off as garish for me, is the map's lighting, better than the original CBP map in small ways, only mappers will really notice the change(see last pic) While the rakish lighting may support the theme, the differences as to how the same light sources react with meshes and BSP is disturbing. Light sources next to meshes that don't have light maps just looks bad IMO. A projector compliments one of the maps windows, its image easily seen in the last pic. 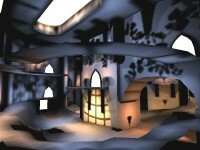 Projectors are one way around ambient lit meshes and avoiding light maps. A couple of the translucent static meshes are actually light boxes, similar to UT light boxes and cones, these fit the maps other unusual shaped brushes to simulate light streaming in. While this may look cool, having light shining in from every angle is far fetched and doesn't meld with the skybox used. I don't think believability was a major concern here, or atleast from the map's fantasy setting standpoint, so will let it slide. One item that was totally objectionable was the unexplained littering of loose tiles strewn throughout the terrain. No where are there breaks in the flooring to account for these extra pieces. Second, all the loose tiles are white, From a checkered floor? it just seems very unlikely. Regardless, the orphaned tiles do tell me that it's okay to make a mess, and go ahead, have fun blowing eachother up. hell yeah!! great map! looks beautiful and flows like a banana! Speaking of fixes, this is a message for other CBP mappers. BR-BreakLimit has loaded up without the static mesh for the falling water. CTF-Betrayal has loaded up missing heaps of textures. Either I got a bad download of the Umod or I'm missing some tex files. It would be appreciated if both these maps could go up singularly on this site. I would really like the relevant textures. They look like great maps to play but the old default texture is ruining the look of both of them. As for CBP generally? Great job!
" but are you sure this is the "final" version? cos i noticed some iffy bits like an invisible wall down the center of this slope and two flak cannons spawn in the same position? " Freaking beautiful. I'd go 9.5 on this but round it up for the twisty, unreal *cough cough* look of all the metal and stonework. Damn nice work from all the maps in that pack too btw! Much thanks for the hard work and for hefting it all to us for free no less. This is sheer brilliance! It's got it all - good theme, gameplay, flow, everything! This is very much a reason I'm keeping UT2003 on my hard drive now! This is an example of why VorLoN is one of the most talented mappers ever (IMO). Great work! Great map its beautiful, good gameplay, great textures and static meshes all in one PERFECT!!! 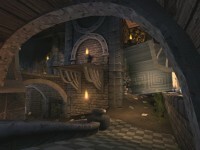 Quick comment: is was just beautiful , Download this map now! What a beautful little gem. Has awesome visuals and flow. The style and the kickin music (I`m pretty sure I heard that one before) reminded me of the good ol`Unreal days. This one will stay on my HD for a looooong time. Download now, cause this map r0xx0rs you. Yeah, this map is great. Smooth, fun and very nice graphics ... and it has a very original theme. 7.5 actually. I have to agree with Riz... This is the only decent map in the whole pack. 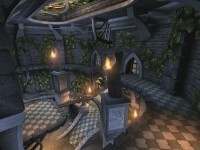 awesome map, good looks, very well used ambient sound.. you can almost always figure out where the other one is hiding. works really well with 3 people too.. the "buggy" version (didn't really notice any) already gave me hours of fun playtime with friends. I have to say that this is a very good 1 vs. 1 maps. Not only does it combine lovely textures and architecture, but it flows well without any dead ends, yet is big enough to hide in certain places, but small to get around quickly. This is the fixed version, and it certain earned its place in the CBP. Awesome map, in my opinion this is as good as it gets. In a strong pack, this map stood out from some of the maps that were simply good. It has character, and a good feel. It's something that a map either has or it doesn't - you cant aim for it, because it just happens. You can be as critical as you like and try and break down a maps score, but really, it's all in the feel of a level.